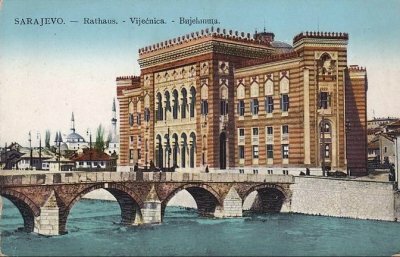 One of the landmark buildings in Sarajevo—the Vijećnica—was difficult to build. Taking 6 years, 3 architects, and over 1 million Kronen (around $700 million today), the design and construction of this building were costly. Some say it was even deadly. Karel Parik—preeminent Czech architect fondly known as the “builder of Sarajevo”— was the first to take on the project. He was removed, however, when he refused to design a building as large as Austro-Hungarian Minister Kallay envisioned. Perhaps he was wise to step away. The second architect, Alexander Wittek, did not survive the process. A year after starting the design he was confined to an insane asylum diagnosed with “paralytic mental disorder.” The following year he died. Some say he committed suicide. Others say tuberculosis. Perhaps the pressure of constructing such a grand building was too much for him to bear. A third architect took up Wittek’s work and completed the project in 1894. The City Hall opened two years later—April 20, 1896. For almost 100 years it stood as a triumph of architectural might and a symbol of Sarajevo. In 1949, the building was handed over to the National and University Library and eventually held 1.5 million volumes and 155,000 rare books and manuscripts. On August 20, 1992, during the almost four year Siege of Sarajevo that killed 11,541 civilians, Bosnian-Serb artillery on the hills above Sarajevo began shelling the Vijećnica. This symbol of Sarajevo quickly burst into flames. Despite the efforts of ordinary citizens and librarians, rushing into the burning building under sniper fire, most of the books were lost. The efforts of three architects, millions of dollars, years of labor was erased in a day. Reconstruction of the National Library began in 1996, but has progressed slowly. First, the rubble was cleared away. Then the roof was repaired. Finally, over the past two years, the exterior was restored to its original beauty (see picture below). Still, two years remain before the national monument can function as a it once did. In all, it will cost $17 million and 18 years to rebuild the Vijećnica. Perhaps you know the feeling. Building is hard. Destroying is easy. Rebuilding is even harder. If you want a quick feeling of power, destroy something. It is easy. Maybe that is why people do it. Destruction is the easy path to power. However, if you want to do something important—build. It is harder. But you leave behind something of value. What are you (re)building? A company, an idea, a book, a song, a family, a relationship, a movement? The process is hard because building is hard. Remind yourself why it is important, why it needs to be built. Don’t let the destroyers around you win. Rise up from the ashes and build something that will stand for 100 years and beyond.